Lough Ree may be the most recognized amongst Irish 'monster-haunts' but few seem to realize how ancient the tradition actually is. A passage in Life of St. Mochua of Balla tells of a hunting party refusing to pursue a stag that had fled to an island on account of "a horrible monster that infested the lake, and was accustomed to destroy swimmers." One hunter decided to chance a swim and arrived on the island without incident, but "as he was returning the beast devoured him." Indication of a 20th century monster in Lough Ree were seemingly blank blank until one well publicized incident broke what had otherwise been an informal code of silence. The incident in this case is perhaps the most famous of all Irish reports as it involved a total of three witnesses whose vocation elevated the issue of credibility to a new height. Father Quigly, Father Murray and Father Burke were all familiar with Lough Ree and at the time fishing off Holly Point. It was 9:30pm on May 18, 1960 on a warm summery evening when one of them pointed towards an unusual object about 100 yards away exclaiming, "Do you see what I see?" "It was moving. It went down under the water and came up again in the form of a loop. The length from the end of the coil to the head was 6 feet. There was about 18 inches of head and neck over the water. The head and neck were narrow in comparison to the thickness of a good-sized salmon. It was getting its propulsion from underneath the water, and we did not see all of it." A drawing of the animal by one of the priests. The testimony of three clergymen was more than enough to create a local stir which quickly poured out from Athlone and seized the attention of the country's leading newspapers. After the BBC caught wind of the matter the story went international appearing in multiple languages. "....its identification poses a most interesting problem." There were two sections above the water; a forward section of uniform girth, stretching quite straight out of the water and inclined at the plane of the surface at about 30 °, in length about 18-24 inches. The diameter of this long leading section we would estimate to be about 4 inches. At its extremity which we took to be a serpent-like head, it tapered rather abruptly to a point. Between the leading and the following sections of this creature, there intervened about two feet of water. The second section seemed to us to be a tight, roughly semi-circular loop. This portion could have been a hump or a large knob on the back of a large body under the surface that was being propelled by flippers. As to the dimensions of this section, if a loop we should say the girth of a large fifteen pound salmon; if however, a round hump. . . we should put its base at about 18 inches. . . We would estimate the overall length to the two visible sections, measured along the surface from tip of snout to end of hump, at about 6 feet. The movement along the water was steady. There was no apparent disturbance of the surface, so that propulsion seemed to come from a well-submerged portion of the creature. There was no undulation of its body above the water. It was cruising at a very leisurely speed, and was apparently unconcerned about our presence. We watched it moving along the surface for a period of two or three minutes in a north-easterly direction. It was going towards the shore; then it submerged gradually rather than dived, and disappeared from view completely. Another couple of minutes later it reappeared still following the same course. . . It reached a point 30 yards offshore, where it submerged and we saw it no more. "One ought not, of course, to assume that the answer to the problem is some completely unknown creature....nevertheless we are in this case convinced that what we saw was not a pike or otter, or any other fish or animal familiar to us, nor was it some inanimate object such as a tree branch carried by a current in this part of the lake.... We were convinced that what we saw was a living creature and we feel that its identification poses a most interesting problem." 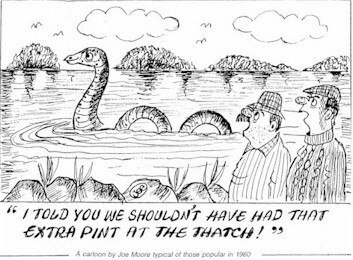 Despite the optimism and excitement surrounding the prospect of Ireland boasting its own counterpart to the Loch Ness Monster, not even priests were immune from the all too predictable onslaught of debunkment. Listed amongst the various and sometimes colorful explanations were inline-swimming otters, a row of ducks or a configuration of several pike entangled upon a hook line. While some sought to slay the Lough Ree creature as a case of misidentification, it didn't take long for locals to break their long silences on the matter and step forward with experiences of their own. One such report told of two men who one evening were walking along the shore at St. Mark's Bay when they saw what appeared to be calf swimming in the lake. It had a raised neck about a foot above the water (this alone disqualifies a calf as they cannot hold their necks out while swimming) followed by a black hump. After rushing out on boat to save the calf, the animal submerged. In Charts of the River Shannon amongst an area of 70 feet deep water a spot is labeled "unidentified snag". The cause for this curious marking is the result of a cabin cruiser striking an unidentified object in mid-channel. The spot was later dragged but nothing was found. Paddy Hanley, a retired postman, added his own experience to the growing collection of reports in Lough Ree. His experience took place a full 30 years prior to the priests' sighting. While fishing north of Yew Point at the mouth of Bally Bay, something powerful took his line. In a somewhat ironic twist, because he was using the strongest fishing line available on the market at the time ("like a rope") Hanley found himself being towed about the lake until finally severing the line. According to Mr. Hanley such a strange occurrence had been claimed by other fishermen on the lough. Joining Hanley's account is F.J. Walters who told that while fishing off Beam Island he'd hooked something using a heavy line. The 'thing' dived rapidly towards the bottom, using up the 70 feet of line before snapping. Such speed, Walters noted, was impossible for any fish. 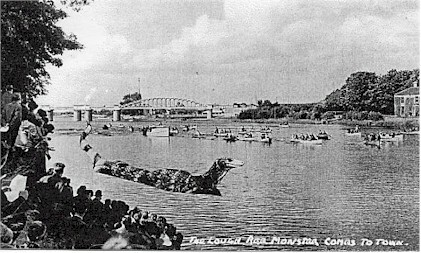 In 1958 two lucky English tourists reportedly had their own experience on the Lough Ree Monster Ride as they were dragged across the lake upon hooking something until one finally cut the line. Two months prior to the priests' sighting a pair of fishermen, Patrick Ganley and Joseph Quigly, fought with something large that had entered their pike net. Though they couldn't quite make out what it was the creature's thrashing reportedly sending up columns of water six feet in the air. It was "strong as a horse" and after finally escaping left a nine-foot hole in the relatively new net. For five days in June of 2001 a three-man team representing GUST (Global Underwater Search Team) conducted an "expedition" into Lough Ree searching for any indications of current lough monster presence through surface monitoring and the deployment of a hydrophone. The team consisted of GUST leader and founder Jan Sundberg of Sweden along with Espen Samuelsen of Norway and myself, at the time on leave from the U.S. Marines. 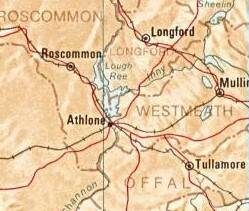 Two events transpired that were later announced as to have possible relevance to the Lough Ree Monster. One was a peculiar sound Jan detected with the hydrophone that he stated as being quite similar to sounds heard on previous expeditions in Norway. The second was an observation had by Jan and briefly noticed by Espen, involving a small, dark tube-like object seen swimming away from a small island. The object was being propelled by something beneath the surface. During our time in and around Athlone I tried my best at asking locals what they recalled as far as stories sightings in the lake. The response always defaulted to the famous sighting by the priests but I acquired an impression that most were assuming we knew more about the matter than they did and therefore didn't know what else they could contribute. Eventually one lakeshore resident mentioned something about a story that had been circulating during the 1970s regarding a sighting of an animal swimming like a dolphin near a lakeside hotel. On a later occasion while socializing at a resort's pub someone referred to a particular time when either American or Canadian tourists had come ashore from a boat trip thinking that they'd encountered a snapping turtle. Apparently something below the surface had seized an oar in its jaws. The behavior was deemed as unlikely for a pike but at the same time there are no known native turtles in Ireland leaving question as to exactly what kind of animal had bit the oar. Not until the final evening of my stay (Jan and Espen were to continue for a few more days) did it became apparent my inquiries themselves were misguided. While out on the lake with a local acquaintance we'd made I asked if he was familiar with the term water-horse. Previously he'd commented that all he had ever heard of the Lough Ree Monster was regarding the sighting by the three priests. But in reference to "water-horse" his response was quite unexpected. He stated that growing up they'd heard of folks seeing them in parts of the lake but had assumed they were mistaking cattle swimming from the islands. That very well may have been the case but what's significant here is how the term "water-horse" was deemed so distinctive that it failed to register within inquiries regarding "lake monsters." How many others would have likewise been able to recall stories from past years of water-horse sightings but otherwise were unfamiliar with reports of a "monster"? The otherwise absence of recent reports does not necessarily imply an absence of recent sightings. Still, even with the consistent media attention centered on the GUST "expedition" it would appear that no new sightings were brought forward despite the inviting atmosphere. At least none that we came to hear of.